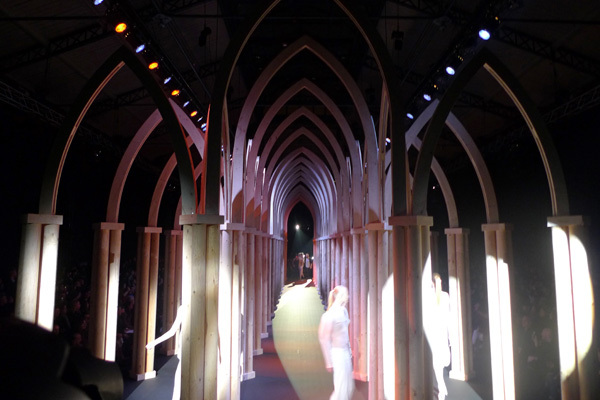 The show of Thierry Mugler was the talk of the day, yesterday. Not only because it was Nicola Formichetti his first womenswear-collection for the house – but because Lady Gaga would also be part of the show. It’s great when a designer is supported by a star, but it also distracts you from the clothes that are actually shown. And that’s a pity. Formichetti designs for the stage, like Mugler himself used to do. These are extraordinairy clothes for extraordinairy women – popstars, clubgirls and stylists who can use some outrageous clothes. The collection was mostly in black, white, pale beige and Mugler’s royal blue, and there were some molded plastic show pieces, as well as animal prints. The silhouette was minimal, with close-fitting dresses that sometimes looked like a second skin. I heard Lady Gaga already ordered some pieces. No wonder.